This post is late but there is a reason. We had a cracker of a day yesterday. Went surfing at Long Beach, NY then cruised home the long way via NYC. 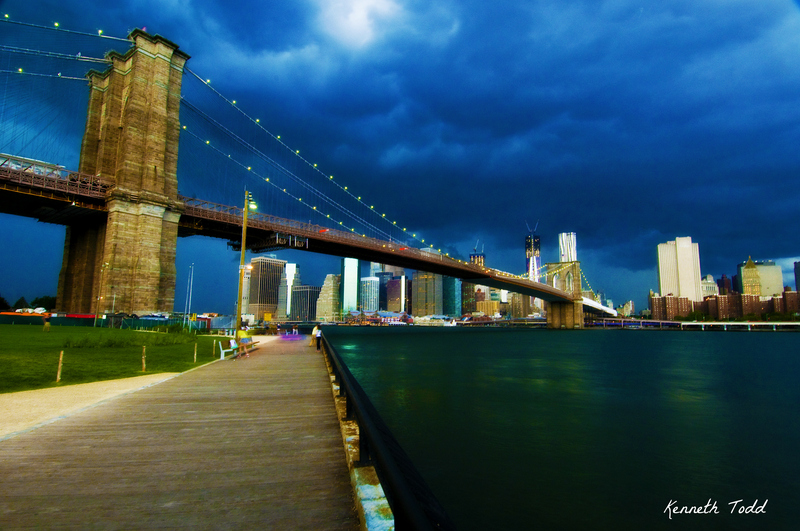 Stopped here at Brooklyn Bridge just as the mother of all storms was approaching. By the time I got to this spot, I managed 7 releases of the old shutter, I didn’t even get the angle I wanted but I had to shoot. No exaggeration, but within 1 minute if this shot the wind picked up incredibly, the water became chop and kids were battling to stand up, as the wind pushed through side buildings and then the heavens opened. It was awesome. Kids were wide eyed and frozen in awe of the power of mother nature. We sat in the car having a little laugh. We then cruised the streets of NYC and went for a late dinner. Kids passed out in the car on the way home and by the time we got home, close to 11, emptying car, carrying kids to their beds etc etc, you know how it goes. The last thing I was going to do was wrestle with technology. A fine day and a cool photo, even though wasn’t the angle I wanted, nor technically perfect. You can see the new Freedom Tower nearing completion with the 2 cranes on top. I actually added a slight Orton Effect which I hardly ever do for Cityscapes but I think it works well with all the colors. I really like this shot – makes the water look like an infinity edge pool. I have to get to NYC some day. Me too, it is one of my favorites. wow….the scene looks like it’s painted! spectacular!